summary: After much planning and training, finally getting a chance to go back to Nepal and challenge two of the North Easts most famous trekking destinations. All travel in Nepal starts from Kathmandu. I will be travelling there via Singapore, arriving in Kathmandu around midday on September 19th. I will base myself in Kathmandu for a few days were I can get the appropriate permits and anything else I need before heading off into the wilderness. The overall plan for this trip is to travel to Shivalaya (Jiri) by bus initially, and then walk to Lukla. This will take about seven days to complete and is leg one of my journey. Second leg of the journey will be done with Edwin and Kelly and we will be heading North out of Lukla towards Everest Base Camp. Once that challenge is done, our third and final leg will be to summit Island Peak, which at 6189m is going to be a real challenge! Eventually returning home in late October. I've decided to do this first leg by foot rather than flying into Lukla for two reasons. Initially it was because there will be reasonable crowds on the EBC trail, but on this trail it should be nice and quite, which is just how I like it! But also aclimatising in this slower fashion should provide me with better resilliance once we hit the higher levels of the Everest region. This section is a long way though, and likely to take me six full days of walking. The difficulty is not the distance, but the fact that I will be walking across the rugged landscape, and not along it. So everyday I will be dropping into a valley, then out of the valley, so lots of up and down. After spending a few days in Kathmandu the start of my travelling has an early start this morning, catching the bus from Ratna Park bus station either 6am or 8am should find a bus direct to Shivalaya. The track is not particularly smooth and will take most of the day. Arriving in Shivalaya, find a comfortable guesthouse for the night. 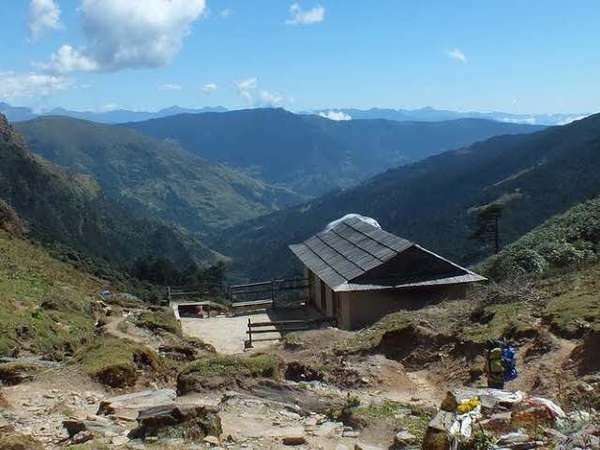 Leave Shivalaya by climbing up to Sangbadanda at 2150m, then Kosaribas at 2500m, and then on to Bhanjyang which is a pass just before Bhandar at 2200m. The walk takes you through beautiful country scenery, mountain villages and farm fields. There should be time at the end of the day to spend some time exploring Bhandar and its surrounding villages. Today we start by heading down hill to the Likhu Khola river at the town of Chaulakharka where we cross using a grand suspension bridge at 1580m. From here we follow the river upstream to the North East until we reach the town of Kinja at 1630m for lunch. After lunch you continue along the trail to the East and uphill through terraced fields with great views back down the valley. The afternoon walk is tough as it relentlessly heads up hill, but you will eventually reach the small sherpa village of Sete with its fantastic accommodation for the night. Todays walk starts with another slow slog up hill until you reach the Lamjura Pass, which at 3530m is the highest point of the trek between Jiri and Lukla. If the weather is good, this is agreat spot to stop and take some pictures of the peaks in all directions around you. After reaching the pass, the trail heads back down hill to the town of Junbesi which is located on the Junbesi Khola river and the end of todays walking at 2675m. From Junbesi the climb starts early as you start heading up the ridge to Phurteng where you will likely get your first views of Mount Everest. You will then trek along the ridge line, through the village of Salung before heading down hill again towards another suspension bridge over the Dudhkund Khola river. After crossing the brdige, make your way to the large town of Ringmu where it is likely you will see apple orchards around the town. After stopping here for lunch, start heading back up hill again towards the town of Taksindu where you will see a cheese factory. The trail keeps heading up hill until you reach Trakshindo Pass at a height of 3071m before once again starting to drop altitude to the town of Nunthala which is your stop for tonight. From Nunthala the track heads down hill quickly, possibly one of the steepest descents of this trip to the Dudh Koshi Nadi river. You will cross a suspension bridge here which is 109m long. Once across the river, the trail starts back up the valley to the town of Jubhing. The trail then continues up hill to the town of Kharikhola before once gain heading down hill towards the Khari Khola river. The end of todays walking will be in the village of Bupsa which is at the top of the ridge with amazing views up and down the valley. From here the trail heads down again to the river of Surke Khola at the village of Surke which is the last stop before heading back up hill to the town of Lukla. Make sure you take the right hand turn as you climb towards Lukla, or you will bypass the town completely and head off to Phakding instead. After spending the first leg of this trip hiking solo, its time to meet up with my travelling partners in Lukla, Edwin and Kelly. From here we will finish our preparation before heading out on the long trail to Everest Base Camp. 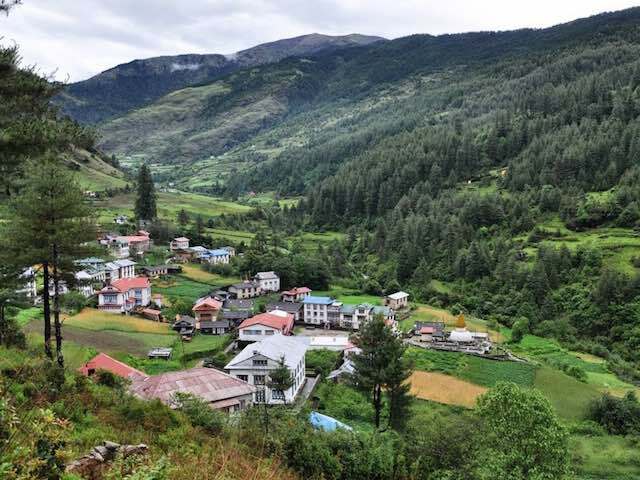 Leaving the hustle and bustle of Lukla behind you, follow the main trail out of town towards Phakding. It is likely that you will be doing this with many other people. The walk is only a few hours to help with aclimation. If you are up to it there are a few short walks from the town of Phakding to fill in the afternoon. After breakfast we walk through beautiful pine forests and then along Dudh Koshi River ending our nature-filled journey at Namche Bazaar. After walking for almost over an hour, we come across the listening Mt. Thamserku (6,608m) on our right and also experience the serenity of pine, fir and juniper forests throughout our journey. If the weather is clear, we may even catch a glimpse of Mt. 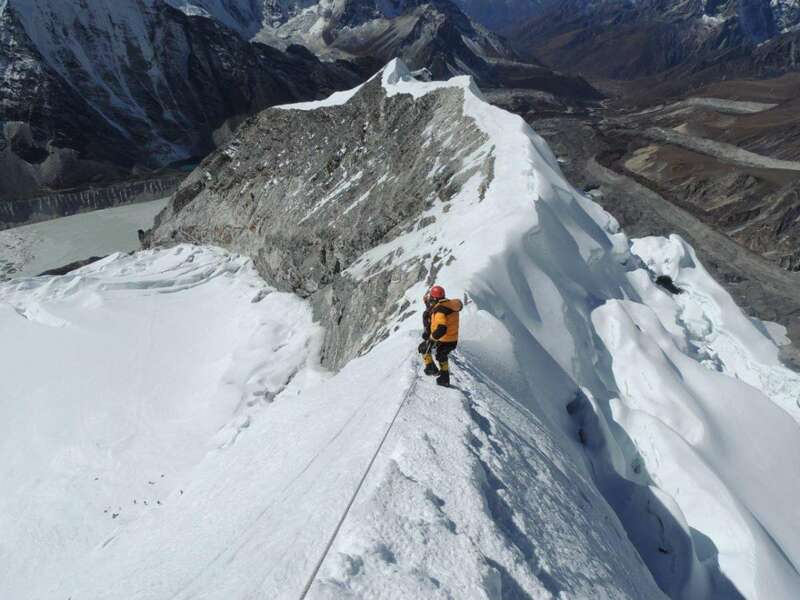 Everest peering over the Lhotse-Nuptse ridge. We continue walking until we reach the entrance to Sagarmatha National Park, Namche Bazaar, the gateway to Mt. Everest and main trading centre of this region. This day we cross five suspension bridges, the last one also known as the Hillary Bridge being the highest. It is an uphill walk from Hillary Bridge to Namche Bazaar. You should treat the following day as an acclimatization day, and plan accordingly. Health experts recommend that we stay active and move around even during the rest day instead of being idle. There are a few options set aside for this day. 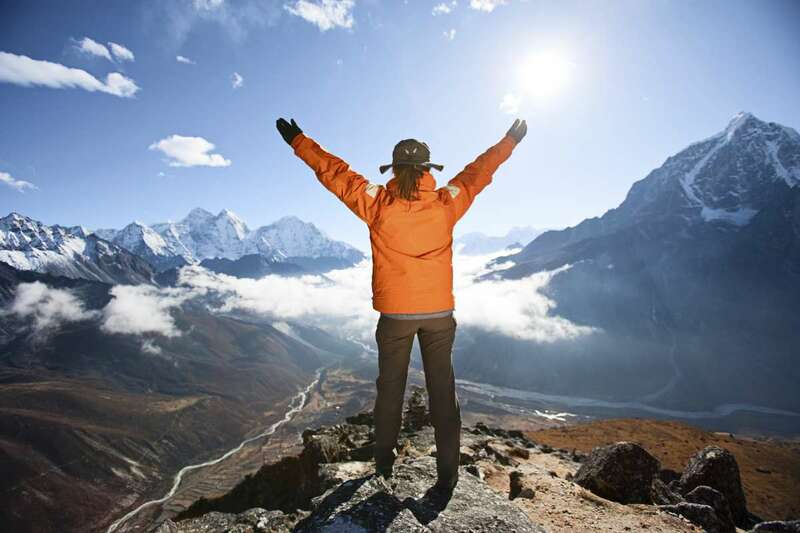 We can either stroll around Namche's quaint villages or come in contact with the Sherpa people and their rich culture, or we can hike up to the Everest View Hotel and enjoy an up-close view of the mighty Everest. 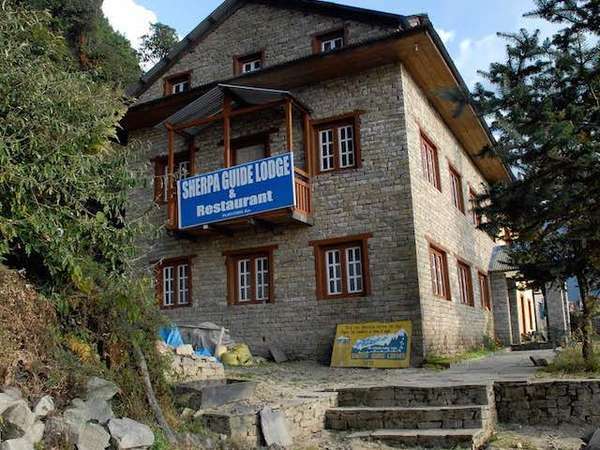 While in the Namche village or upon returning from the hike to the Everest View Hotel, trekkers may also visit the local museum containing exhibits displaying the area's native flora and fauna as well as the history of the Mount Everest region. After breakfast, we trek towards Tengboche. It is an easy walk from Namche to Phunki. Upon reaching Phunki, we ascend towards Tengboche, a village that houses the very famous Tengboche monastery which is the largest monastery of the Everest region. Located amidst the Sagarmatha National Park (a UNESCO World Heritage Site of outstanding universal value), it is draped with the panoramic 360-degree view of the Himalayas, including Mt. Everest, Nuptse, Lhotse, Ama Dablam and Thamserku. The monastery opens at 3pm so we reach there by three. And, if we are lucky we might just be able to witness a religious ceremony. With the Himalayas as its backdrop, the monastery in Tengboche is in an excellent location. We visit the monastery in the morning and enjoy taking pictures of the monastery and the amazing landscape. We descend for about half an hour through a forest before crossing a river. Next, we trek uphill and notice that as we climb higher, the landscape becomes drier. We walk past a traditional Sherpa village of Pangboche before reaching a fork in the road where we need to decide Pheriche or Dingboche? Pheriche is a beautiful village located on a riverside. There is also a small helipad that is used for helicopter rescues during emergencies. You may want to take a class with a mountain specialist in the Medical Clinic at Pheriche. 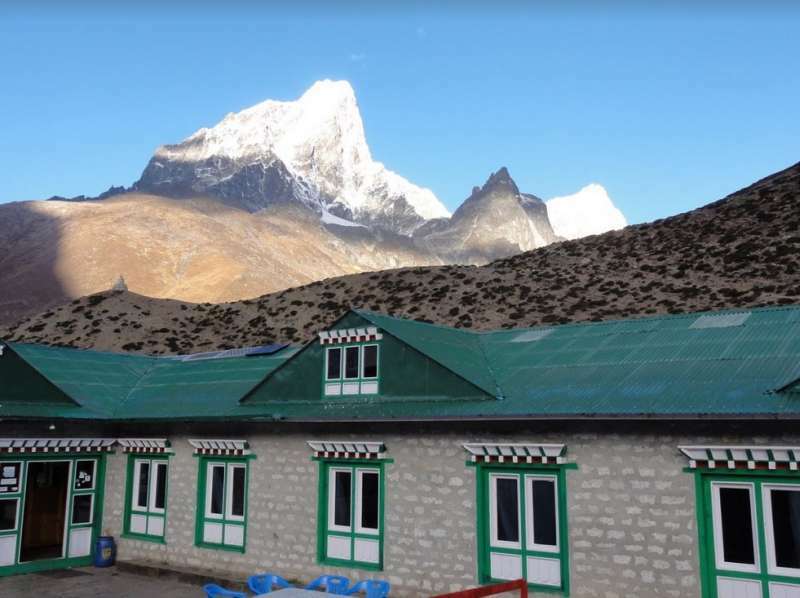 Dingboche is the better overnight alternative than the village of Pheriche, in being sunnier and less affected by the icy winds that descend through the Valley of Khumbu. But either will make a good location to end the day, and to spend our next acclimatization day. Nangkartshang Gompa, North of Dingboche. Good views east to Makalu - for the hike above Dingboche -- use Google Earth and you'll easily see that Dingboche is nestled at the bottom of a hill/ridge that lies just north. You can see the trail up this ridge in the satellite photos. People usually climb up to the rocky outcrop, which is at about 5000m elevation. Where the icy wind can cut you in half (or at least it feels like it). This outcrop is called Nangkar Tshang, and there are great views from it. After breakfast, we start with an easy walk towards Dugla. Next, we trek up the steep terminal moraine of the Khumbu Glacier, and then pass through the boulder-strewn slopes as we ascend Chupki Lhara where we find an array of stones with prayer flags used as memorials to Scott Fischer (American mountaineer) and 10-time Everest summitter Babu Chiri Sherpa (Nepalese mountain guide) who perished on a mission to climb Everest. The trail then continues to the Khumbu Glacier moraine and we find ourselves facing several great peaks - Khumbutse, Lingtren, Pumori and Mahalangur Himal. 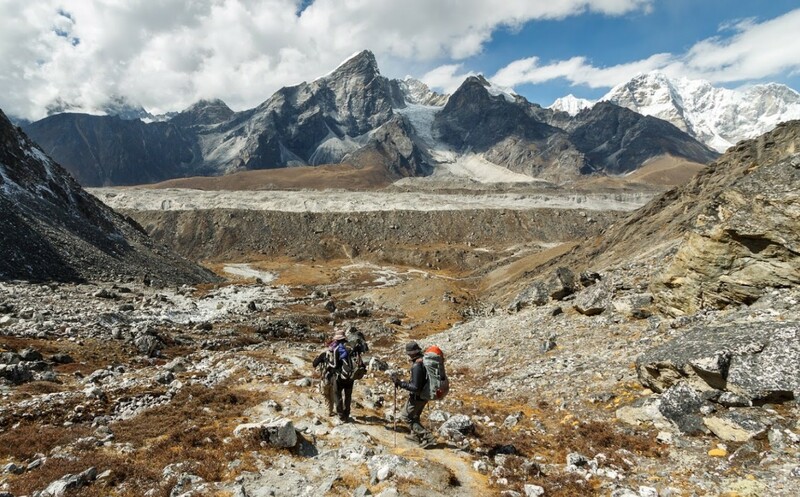 We take the trail to Everest Base Camp through the once vast Gorak Shep Lake. Continuing straight ahead, we come across the Indian army mountaineers' memorials. The path from here can be misleading so we need to take care and possibly ask locals for directions. The walk is strenuous due to thin air in the high altitude. 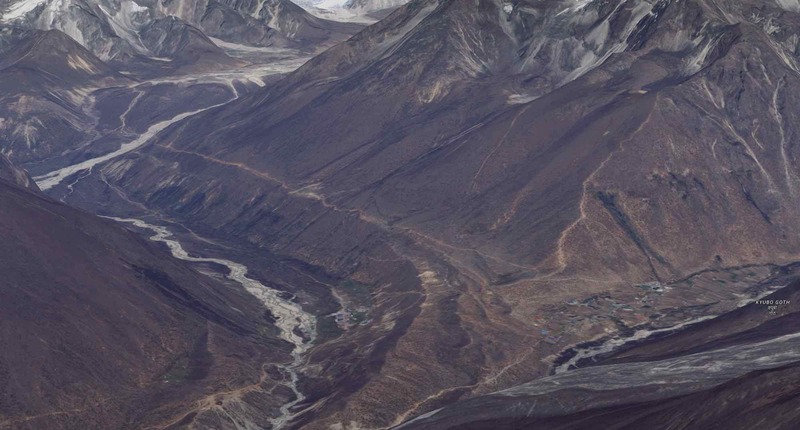 We pass through rocky dunes, moraine and streams before reaching the Everest Base Camp. Upon reaching the Everest Base Camp, we see tents of mountaineers that stand out in bright colors against the monotony of gray surroundings (especially in the spring). Nuptse, Khumbuste and Pumori are the mountains we can view from the base camp. We get back to Gorak Shep for a good night's rest. We prepare for an early morning departure, amid pre-dawn darkness and cold temperatures (-10 to -14 C). Plus, there is always the potential for chilly winds which are quite common. Familiar peaks such as Lingtren, Khumbutse, and Changtse tower to the east even as Everest begins to reveal itself. 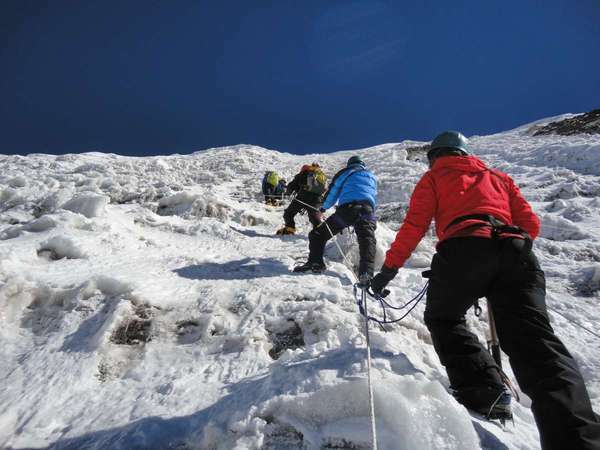 But, it is upon reaching Kala Patthar that we get to see 360 degree up-close and formidable views of Mt. Everest. We take pictures, enjoy the magnificent mountain panorama, and then return back to Lobuche for a good night's rest. Hopefully with the euphoria of Everest Base Camp still flowing through our bodies, we embark on the most difficult leg of the tgreat adventure, summiting Island Peak. 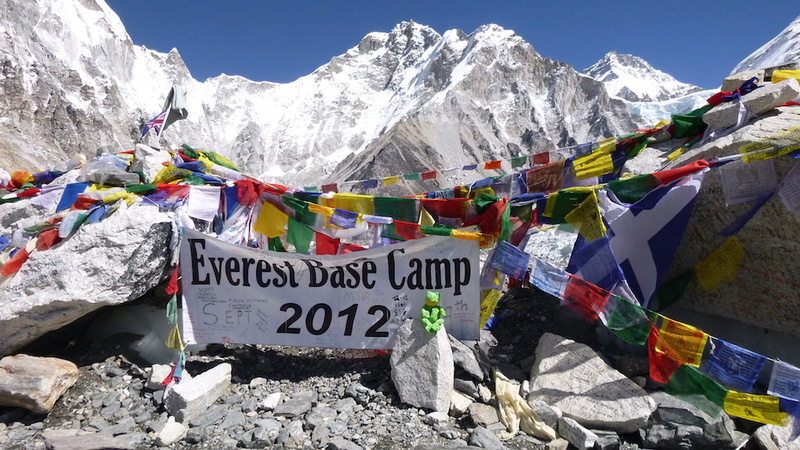 After breakfast, we trek via Khumbu Glacier to Kongma La Base Camp (5,000m/16,404ft). The ascent to Kongma La pass is the most difficult part of our trek today. In the Kongma La, we see cairns wrapped in prayer flags to mark the pass. Then we descend gradually to Imja Khola valley, followed by another descent to Chhukung, a small summer settlement. 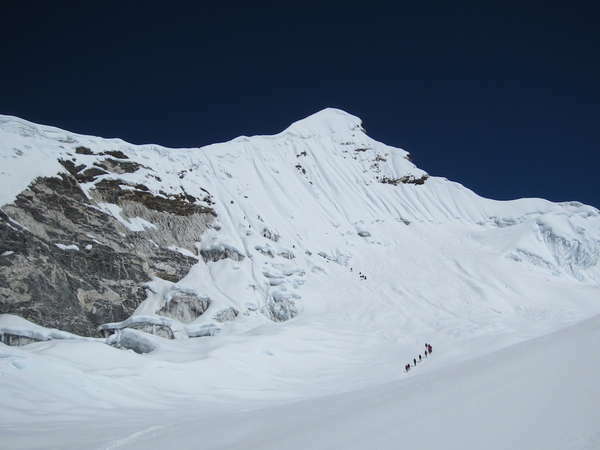 After reaching Chhukung we will also need to arrange our equipment and guides/porters. Note: If you do not want to undertake the Kongma La pass, you can follow another route via Dingboche to Chhukung instead. The trek to Island Peak Base Camp is on a fairly steep trail. First, we climb south then turn east to the main line of the valley. 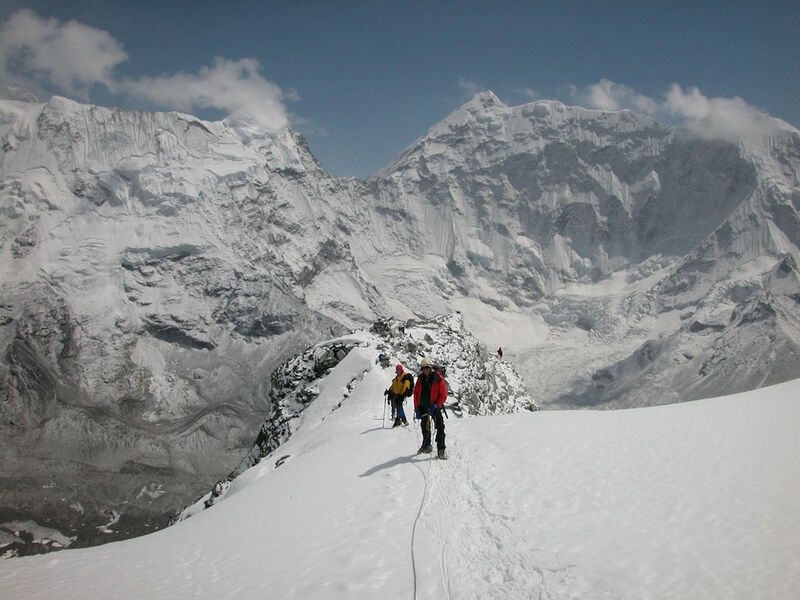 We then walk on a winding path below the southern flank of the moraine from the Lhotse Glacier. Next, we continue walking on a pleasant trail along a streamside. The route to the Amphu Labtsa lies to the southeast. A criss cross route through the Imja and Lhotse glacier moraines leads to a wide valley flanking the SW side of Island Peak. We may have a rest day here, or training for climbing Island Peak, or a buffer day for weather delays. We wake up early today at around 1 to 2 am and have our breakfast before beginning our climb. It is important we reach the summit before noon because in the afternoon the strong winds in the high lands might become a barrier for a successful summit. The trail moves up beyond the base camp for several hundred meters before striking off the steep hillside. Initially sandy, the path soon turns to grass before becoming boulder strewn. As we climb up the hill, we will see that the slope narrows and the trail enters a steep rock channel. We climb the rock gully. This is not difficult but there are several short rock steps to climb before we emerge on the right side of the gully. The route then follows a ridgeline, which leads to an exhilarating and exposed traverse onto the snout of the summit glacier. We need to rope up for the glacier as it contains several crevasses. The guides will fix a rope wherever necessary. A steep snow slope leads us onto the summit ridge. After enjoying the summit views, and taking pictures, we descend all the way to Island Peak Base Camp and then onto Chhukhung. We celebrate our successful Island Peak climb. Todays walk will be a much easier as we descend to the lower altitudes. Following the same route back through the wide valley of Khumbu Khola, we pass through the beautiful Sherpa villages Orsho and Shomare. We can also take a different trail to visit the Gompa in Upper Pangboche, which is believed to be the oldest in the Khumbu region or take the regular trail to reach Pangboche. Pangboche is a scenic village surrounded by Everest to its north, Ama Dablam, Thamserku, and Kangtaiga to the east, the Kongde range to the south and the Imja Tse river flowing through the wide fertile valley. From Pangboche we retrace our steps down to the Imja Khola and up through the forest to Tengboche. If interested, we can also visit nuns at the Tengboche monastery. After lunch at Tengboche, we continue through the hillside blanketed by rhododendron and juniper trees. After crossing the bridge over the Dudh Koshi River, our trail follows the Dudh Koshi gorge descending rapidly through the pine forests before reaching Sansa. We keep a lookout for wildlife such as mountain goats, snow leopards, colorful pheasants, etc., while passing through the forest. After passing a chorten, we reach the army camp at Namche Bazaar. Finally time to rest and celebrate our amazing achievements. We have several buffer days built into the plan too, so its likely we will use those up here in Lukla, or head straight back to Kathmandu to recover from this amazing adventure. Hold onto your hats, we are flying back to Kathmandu! From here, the trip back to Sydney via Singapore will likely come with some regrets, or perhaps satisfaction.